Chairman Paul Gosar (AZ-04): "Nobody knows the Department and Interior issues better than David Bernhardt. His intelligence, incredible work ethic and responsiveness are unmatched. A public servant for more than a decade, Acting Secretary Bernhardt has worked diligently to increase hunting and fishing access, ensure clean water for future generations and empower local decision-making. David is a champion of the West, sportsmen and rural communities. He is a man of impeccable integrity. No one is more qualified. I urge my colleagues in the Senate to confirm him as soon as possible." Senate Committee on Energy and Natural Resources Chairwoman Lisa Murkowski (AK): "I strongly support David Bernhardt to serve as the next Secretary of the Interior. He already has helped the Department accomplish a great deal for Alaska and the nation, both as deputy secretary and as acting secretary, and he is more than capable of leading on a permanent basis. I will schedule a hearing and seek to move his nomination forward as expeditiously as possible." House Natural Resources Committee Ranking Republican Rob Bishop (UT-01): "It’s a brilliant move. No one is more experienced and I look forward to working with him." Vice-Chairman for Indian Affairs and Oceans Don Young (AK-At Large): "I was very fortunate to meet with Acting Secretary David Bernhardt last week, and was impressed by his great knowledge on issues important to Alaska. Mr. Bernhardt is an honest, hardworking man and a tremendous asset to the Department of the Interior. It is imperative that the Senate swiftly confirm him as our next Secretary of the Interior. I wish Mr. Bernhardt the best of luck throughout the confirmation process, and hope he remains resilient against attacks from organizations that oppose responsible land use and resource development." Executive Vice-Chairman Scott Tipton (CO-03): "David is an excellent choice for Interior Secretary. His tenure as Deputy Secretary has shown his commitment to upholding multiple-use on public lands and representing the voices of the West in Washington. It will be great to see a native of the Third Congressional District of Colorado at the helm of Interior, and I look forward to our continued work together." Chief Infrastructure and Forestry Officer Bruce Westerman (AR-04): "During his tenure at the Department of Interior, Acting Secretary David Bernhardt has proven that he’s committed to our nation’s resources and public lands. I am eager to continue working with him, and hope for a swift confirmation in the Senate." Chief Regulatory Reform Officer Andy Biggs (AZ-05): "President Trump has been a great friend to people in the West. Over the last two years, the Department of the Interior repealed overreaching Obama-era regulations, streamlined the path for sustainable energy and natural resource development, and expanded access for hunting, fishing, and recreational shooting on public lands. I believe that Acting Secretary Bernhardt will build on the good work that Department of the Interior has done for western states, and I look forward to his swift confirmation." Chief Agriculture and Business Officer Doug LaMalfa (CA-01): "I applaud the decision by President Trump to nominate Acting Secretary Bernhardt for Secretary of the Department of the Interior. He has chosen a nominee that brings a wealth of industry experience and expertise to the table. Under this Administration, I’ve worked with the Department of Interior to help protect our public lands, increase water storage, and improve forest management policies in California - I expect that will continue under the leadership of Secretary Bernhardt. I urge the Senate to move quickly on the confirmation process." Chief Water and Wildlife Officer Tom McClintock (CA-04): "During the recent shutdown, David Bernhardt proved himself an exemplary leader and manager by taking extraordinary measures to keep our parks open for business and available to the American people. His practical, realistic and scientific approach to forest management is essential to the recovery of our public lands from years of federal neglect. He will be one of the great Secretaries of the Interior." 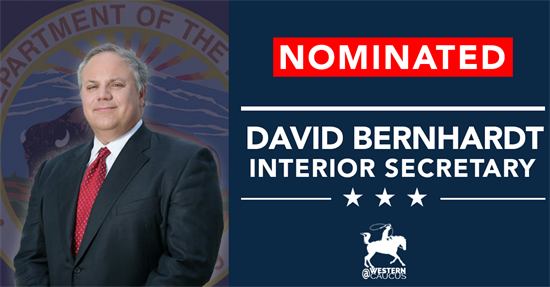 National Republican Congressional Committee Chairman Tom Emmer (MN-06): "It is encouraging to see David Bernhardt nominated to serve as the next Secretary of the Interior. Through his various roles at the Department, under numerous administrations, Acting Secretary Bernhardt has developed an expertise few have. His deep understanding of the balance between management of federal lands, conservation, and development will serve our nation well. I look forward to seeing him confirmed soon." Rep. Ken Calvert (CA-42): "I want to offer my heartfelt congratulations to David Bernhardt on being nominated as our next Secretary of the Department of the Interior. David has done a tremendous job as Assistant and Acting Secretary with the Department, and this nomination is well deserved. I’m especially pleased to see someone with such an intimate knowledge of California’s water issues serve as our Interior Secretary. I think it’s a huge win for California to have someone with David’s experience in this role at a time when our state is making historic investments in water infrastructure projects that will deliver a reliable and affordable water supply for generations." Rep. Aumua Amata Radewagen (American Samoa-At Large): "The U.S. Territories depend on their relationship with the Interior Department and benefit when there is a consistent vision from its leadership. I appreciate President Trump’s nomination of Acting Secretary David Bernhardt to provide that important continuity to the Department, and I support Senate confirmation of the President’s choice." Rep. Ron Estes (KS-04): "I welcome President Trump’s nomination of Acting Secretary David Bernhardt for Secretary of the Department of the Interior. Upon confirmation, I look forward to continuing to work with Sec. Bernhardt and the Department on issues important to Kansas, including supporting farmers and ranchers, protecting our natural resources and finding a long-term solution to address water rights at the Quivira National Wildlife Refuge. I call on the Senate to swiftly confirm the president’s nomination." Rep. Russ Fulcher (ID-01): "Congratulations to Deputy Secretary Davis Bernhardt on his nomination for Secretary of the Department of Interior. I look forward to working together to support the Department's priorities to decrease burdensome regulations, encourage resource management at the local level, and support both American energy independence and the American workforce through wise management of our natural resources." Rep. Doug Lamborn (CO-05): "I applaud the nomination of David Bernhardt to serve as Secretary of the Department of the Interior. As a Colorado native, he has already accomplished great work in our home state. David has repeatedly demonstrated a capacity to translate his vast knowledge of water, public lands, and other western resource issues into policies that work. I trust the Senate will move quickly to confirm him quickly. I know he will keep delivering results that work for our country." Rep. Larry Bucshon (IN-08): "President Trump made the right choice in nominating Acting Interior Secretary David Bernhardt to permanently lead the Department. His resume speaks volumes and he immediately brings to the table his institutional knowledge on Interior issues and how the department operates, which will make for a seamless transition. I urge the Senate to confirm to work quickly to confirm him." Rep. Ken Buck (CO-04): "It’s great to see a Colorado native nominated to lead the Department of the Interior. David Bernhardt brings tremendous leadership with him from our home state. I look forward to a swift confirmation process." On Monday, President Donald J. Trump announced that he will be nominating Acting Secretary David Bernhardt as Secretary of the Interior. Click here to view the President Trump's tweet. Acting Secretary Bernhardt was nominated by President Trump for the position of Deputy Secretary in April 2017 and the U.S. Senate confirmed him in July 2017. Click here to view our press release applauding his confirmation as Deputy Secretary. Mr. Bernhardt is an avid hunter and angler and recently served on the Board of Game and Inland Fisheries for the Commonwealth of Virginia. He has in-depth experience in legal matters concerning active regulations and rule-makings, with years of legal experience in both the government and the private sector. His expertise ranges from the Endangered Species Act to Outer-Continental leases, from mining royalties to Indian Affairs. From 2001 and 2009, he held several positions within the Department of the Interior, including serving as Solicitor. In that capacity, he led the International Boundary Commission between the United States and Canada and was responsible, along with his Canadian counterpart, for maintaining the 5,525 mile international boundary between these two nations. Prior to that, he served then-Secretary Norton as a deputy solicitor, deputy chief of staff and counselor to the Secretary, and as director of Congressional and Legislative affairs and counselor to the Secretary. A native of Rifle, Colorado, Bernhardt earned a B.A. in political science with a minor in business administration from the University of Northern Colorado in Greeley in 1990. He graduated with honors from the George Washington University National Law Center in 1994 and is admitted to various state and federal court bars. He is married to Gena Bernhardt. They have two children and reside in Arlington, Virginia. As always, you can follow everything Western Caucus on our Website, Twitter, Facebook and Instagram.